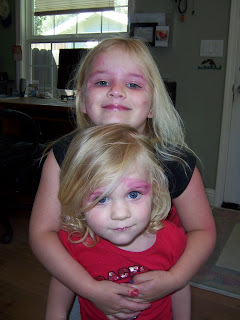 Motherhood, mayhem, and mirth: FIVE YEARS OLD! Dylan will be five on June 19. FIVE! As usual, I feel like lamenting the passage of time, but I’ll spare you the details today. Instead let me tell you about my wonderful daughter. She loves animals, people and nature. She loves her little sister. She loves all of her grandparents. 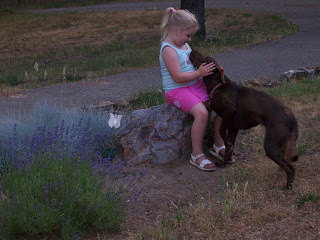 And she loves her dog, Zoey. She has crazy dreams and likes to share them in the middle of the night. Playing pirates and knights is a favorite pastime. 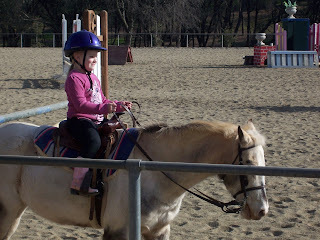 And she can wield a sword while riding a stick horse better than a few of the riders at Medieval Times. She has a passion for anything horse related. She is a true dare-devil. The first time she rode a tricycle, at 18 months old, she didn’t think sitting on the seat was enough fun so she stood on the seat with one foot while putting the other as high in the air as she could. She wants to swing higher, spin faster and needs the adrenaline rush. She screams for her Dad to “Go Faster” on the quad. She can’t stand bad breath or any sort of bodily function. Being anywhere nearby while I change her sister’s dirty diaper makes her gag. She loves to make crafts, paint and color. She is always running out of glue and losing her scissors. She likes to make silly faces during dinner and after dinner she and Hayden put on a “show” for us every night. She loves to dress up in costumes. She is a very special little girl. Very loved and very loving. Happy birthday Dylan! what a precious little girl! I started writing little letters like that to the kids last year. Happy Birthday Dylan. Keep your chin up. Kat are you amazed at how fast it goes? it seems like when we added the 2nd one into the mix instead of time being speeded up it flys by so fast that I can barelky grasp what day it is. Hope Dylan had a great birthday. Oh Happy Birthday Dylan! What a wonderful, loving tribute Kathy. Print it out right now and put it in her scrapbook. She'll love to know how you share your pride of her with others. Happy Birthday to her! Great pictures.